Walter Anton Berger (October 10, 1905 – November 30, 1988) was a Major League Baseball outfielder who played for four National League teams, primarily the Boston Braves. Berger was the National League's starting center fielder in baseball's first All-Star Game. One of the league's top sluggers of the early 1930s, in his initial 1930 season he hit 38 home runs, a record for rookies which stood until 1987. He still holds a share of the NL record. He also led the league in home runs and runs batted in in 1935, and went on to become the seventh NL player to hit 200 career home runs. Born in Chicago, Illinois but raised in San Francisco, California, Berger played third base for Mission High School, sharing the infield with future Hall of Fame shortstop and American League president Joe Cronin, who manned second base. Through 2015, he was one of three players to hit 20 or more home runs in their rookie year before July, along with Albert Pujols (2001) and Joc Pederson. Berger's 38 home runs as a 1930 rookie established a major league record that would stand for 57 years until eclipsed by Mark McGwire's 49 in 1987; his NL record was tied by Frank Robinson in 1956, but has not been broken. Berger still shares the major league record for home runs by a first-year player (no prior major league games) and also still holds the record for the fastest player to hit 20 home runs, as he hit his 20th home run in his 51st game. Berger batted .310 that season, and his 119 runs batted in were also an NL rookie record, since topped by Albert Pujols in 2001. 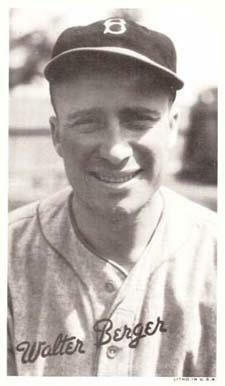 Berger made the NL All-Star team in the first four years the game was held (1933–36), starting in the first two. In 1933 he finished third in the Most Valuable Player voting, behind Carl Hubbell and Chuck Klein, after hitting 27 home runs (half the Braves team total), second in the league behind Klein's 28. That same year, when Babe Ruth was asked once again to make his annual selection of the game's best, he named Berger as his center fielder. Of the eighteen players who started the 1934 All-Star Game, Berger is the only player not elected to the Major League Baseball Hall of Fame. In 1935, he led NL outfielders in putouts with 458. Eddie Mathews broke his Braves franchise record of 38 home runs in 1953, the team's first year in Milwaukee, and surpassed his mark of 199 career home runs in 1957. After a 1936 shoulder injury, Berger was traded to the New York Giants in June 1937; his first home run for the team was the 200th of his career. In the 1937 World Series, he made only three pinch-hitting appearances, going hitless. In June 1938 he was traded to the Cincinnati Reds, where he would remain until 1940; his 1939 World Series performance was even more dismal than in 1937, going 0 for 15. He ended his career in 1940 with the Philadelphia Phillies. In an 11-season career, Berger posted a .300 batting average with 242 home runs and 898 RBI in 1350 games played. Following his retirement as a player, he was a scout for the New York Yankees and managed their Manchester, N.H. minor league team in 1949. Berger died of a stroke in Redondo Beach, California in 1988. He was interred at Inglewood Park Cemetery, Inglewood California.